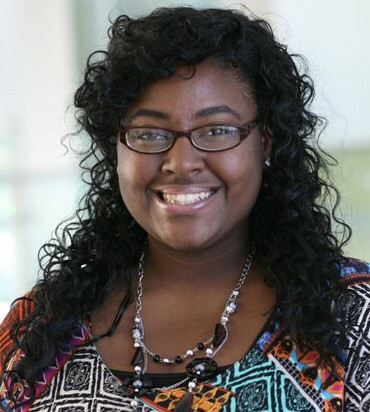 Zipporah-Darvi Redding, CPhT, a pharmacy technician with the Medication Therapy Management Communication and Care Center, or MTMCCC, in Orlando, was one of 11 pharmacy leaders nationally to receive a 2016 Next-Generation Pharmacist Award. Presented by Pharmacy Times and Parata Systems, the awards are given annually to pharmacy professionals who contribute to the industry’s success as top pharmacists, technicians, student pharmacists and industry advocates. This year more than 500 nominations were received across 11 categories and an independent panel of judges evaluated entries based on professional standards, experience as it relates to each category and advancement of the profession. Redding is the first pharmacy technician from UF to win the award. She joined the College of Pharmacy’s MTMCCC in 2012. As one of the center’s lead technicians, she manages a team of highly effective technicians and clinical associates that support pharmacists in providing medication therapy management services at MTMCCC. Katie Neff-Golub, Pharm.D., director of medication therapy management at WellCare Health Plans and a UF residency program preceptor, and Dean Koskinas, Pharm.D., a PGY-1 resident in the UF MTMCCC residency program, presented the award-winning poster at the Academy of Managed Care Pharmacy Annual Meeting in San Francisco. 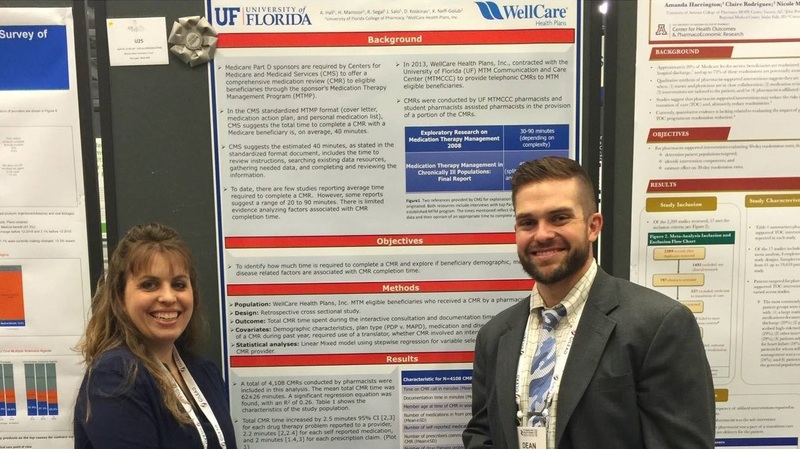 A University of Florida study examining the factors associated with how much time is needed to complete a comprehensive medication review has received a silver medal at the Academy of Managed Care Pharmacy Annual Meeting. UF researchers at the College of Pharmacy’s Medication Therapy Management Communication and Call Center, which is contracted by WellCare Health Plans Inc. to provide telephonic medication reviews, investigated factors influencing the time it takes a pharmacist to complete a medication review. The Centers for Medicare and Medicaid Services, or CMS, requires all Medicare Part D sponsors to offer a comprehensive medication review to eligible beneficiaries through a medication therapy management, or MTM, program. CMS suggests the average review lasts 40 minutes, but other studies have shown the reviews can take anywhere from 20 to 90 minutes. MTM leaders benefit from knowing the average review time in order to determine the resources needed to provide the required services. UF researchers analyzed more than 4,100 medication reviews and found many factors can influence the time spent reviewing a patient’s medication. The study found that a patient’s health, where he or she lives and medication-related factors can all impact the time it takes a pharmacist to complete the review. For example, the study found that patients living in the Midwest had a two minute reduction in the medication review time compared to patients living in the south. The award-winning abstract was published in the April 2016 issue of the Journal of Managed Care & Specialty Pharmacy. The University of Florida Medication Therapy Management Communication and Care Center was featured in a May 2016 Pharmacy Times article about motivational interviewing. To read the article, visit: http://www.pharmacytimes.com/news/making-sense-of-motivational-interviewing-part-2-clinical-economic-and-other-evidence. 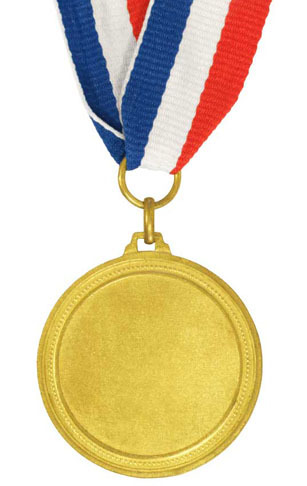 The Academy of Managed Care Pharmacy has awarded two gold medals for abstracts developed by researchers at the University of Florida College of Pharmacy’s Medication Therapy Management Communication and Care Center, or MTMCCC. A team of UF researchers tested a modified recruitment script to encourage Medicare-eligible members to participate in a comprehensive medication review. Researchers developed the new script to overcome barriers that had previously prevented patients from participating in a comprehensive medication review and found the new version to be effective in converting members who had initially declined a review. The findings may prove beneficial when in 2016 Medicare prescription drug benefit plans, MAPD and PDP, will be rated on a new Star Ratings quality measure that examines the percentage of medication therapy management-eligible members that participate in a comprehensive medication review. A research team including UF College of Pharmacy faculty members Teresa Roane, Pharm.D., BCACP, Haesuk Park, Ph.D., and Ayoade Adeyemi, a post-doctoral fellow under the supervision of Park, examined the effectiveness of a telephone outreach program initiated by UF’s MTMCCC to improve medication adherence for patients with diabetes and hypertension. The MTMCCC engages health plan members enrolled in a Medicare Advantage Prescription Drug plans through live, telephone assessments to determine potential barriers, and provide interventions, to improve medication adherence. The research study analyzed medication refill claims data for more than 12,000 members through a treatment and control group and found MTMCCC’s telephone adherence program demonstrated a significant increase in medication adherence. Researchers will present the gold medal abstracts at the Academy of Managed Care Pharmacy’s Nexus 2015 conference in Orlando on Oct. 26-29. In addition, the abstracts will be published in the Journal of Managed Care & Specialty Pharmacy. BETHESDA, MD 12 Feb 2015—The extra weight that Medicare applies to the medication-adherence measures in its quality-rating system for health plans means opportunity and a revenue stream for at least one group of pharmacists. Medicare’s “star ratings” system incorporates three measures of medication adherence. All three were developed and are maintained by the Pharmacy Quality Alliance, which has over 100 member organizations, including ASHP. The measures are used to assess patients’ adherence to prescribed regimens of oral antidiabetic therapies in the absence of insulin therapy, renin–angiotensin system antagonists for hypertension management, and statin drugs for cholesterol lowering. Medicare’s private health plan and prescription drug plan members are deemed adherent with a regimen if they obtain enough medication to cover 80% or more of the prescribed doses. More can be done, but resources are limited Soojin Jun’s desire to become a pharmacist stemmed from personal experience taking care of her dying father, a Korean immigrant. Jun, PharmD, now a pharmacist at Aurora Healthcare in Wisconsin, was her father’s primary caretaker during his long battle with esophageal cancer. He was also diagnosed with diabetes and was left with a complicated medication regimen that needed to be managed closely. A second, consecutive hypoglycemic episode landed him in the hospital, where he died suddenly. Jun said she felt a lack of understanding from his providers throughout the illness. She enrolled in pharmacy school a couple of years after his death. To this day, she’s felt a personal responsibility to push for more health literacy in the pharmacy profession, and not just for patients with limited English proficiency. “In hindsight, all we needed was comprehensive education from a [diabetes] educator—and this could have been a pharmacist,” Jun told Pharmacy Today. For patients prescribed multiple drugs for a variety of chronic health conditions, adherence — staying on track with daily medications — can be challenging, and when doses are missed or stopped, a cycle of dangerous health risks can begin. In January, a researcher at the University of Florida College of Pharmacy received a grant to examine data from an intervention program that helps patients stay on needed medications. A one-year, $50,000 award from the Pharmaceutical Research and Manufacturers of America Foundation will fund Hall’s research showing the effectiveness of the center’s medication adherence services for Medicare Advantage prescription drug plan members of WellCare Health Plans, Inc. — a government-sponsored health care provider. Contracted by WellCare, UF is coordinating its services with a company that uses a modeling tool for predicting prescription-taking behavior. The company, RxAnte, uses its risk score to determine which patients will potentially benefit from the adherence services provided by UF. In 2012, the UF team developed a program to help plan members stay on course with their prescribed medications. Technicians and pharmacists at the UF Medication Therapy Management Communication and Care Center contact the members by telephone to identify patient-specific barriers, such as medication expense, complaints of side effects or the belief that a drug isn’t needed, and offer interventions tailored for individual patients. The center provides ongoing follow-up support to encourage medication adherence, such as reminder tools, patient education, solutions for obtaining timely refills and tools to address issues such as high medication costs that might present an obstacle for patients. Under the new grant, UF will begin analyzing patient data and measuring the program’s overall effectiveness in improving individual patient adherence and overall adherence scores for the health plan. The award is funding research that will measure the success of the combined efforts of UF’s adherence services together with RxAnte’s predictive analytics. The research aims to better predict which services patients need to help keep them on track with their medications, estimate the cost-effectiveness of these interventions and determine how well they are working; all factors that affect the prescription drug plan’s quality ratings. All Medicare Advantage prescription drug plans receive quality ratings, called “star ratings,” from the Centers for Medicare and Medicaid Services based on health plan data. Star ratings are publicly reported and impact health care provider reimbursement based on the Centers’ “pay for performance” guidelines, which reward providers for attaining certain measures for quality and efficiency. UF’s research will evaluate the impact of UF-contracted services on WellCare Health Plans’ star rating for three measures related to medication adherence for three classes of drug: oral diabetics, antihypertensive medications and cholesterol-lowering medications. Tom Menighan, Executive Vice President and CEO of APhA, visited the UF MTM Communication and Care Center (MTMCCC) on October 26, 2011. He graciously spent the day with MTMCCC faculty, staff and students learning about operations, research, and future center plans. The UF MTM Communication and Care Center was honored to be the cover feature in “Pharmacy Today” magazine February 2011. The magazine features an article discussing the center’s student training, operations, and MTM counseling. The February issue can be found on Pharmacy Today’s website. “It’s one thing for a doctor to prescribe medicine. It’s another thing for a patient to take it properly and not mix it with other drugs.” The WCJB-TV20 Medical Spotlight features Heather Hardin, Pharm.D., who explains how the UF Medication Management Therapy Communication Care Center is aiding patients. Imagine sitting in your den, chatting with your pharmacist over a cup of coffee. For one uninterrupted hour it’s just you, your prescription medications and your pharmacist — answering your questions. In a partnership with national health plan company WellCare Health Plans, Inc., the UF College of Pharmacy is receiving $2.5 million to establish a Medication Therapy Management Call Center. The call center satisfies a government requirement for health-plan providers of the Medicare prescription drug benefit to provide once a year comprehensive medication review with quarterly follow ups, called Medication Therapy Management (MTM).